The Bicolored Angelfish (Centropyge bicolor), also known as the Two-colored Angelfish or Oriole Angelfish. It is hermaphroditic, very difficult to breed in an aquarium, and has no distinguishable differences in color between male to female. 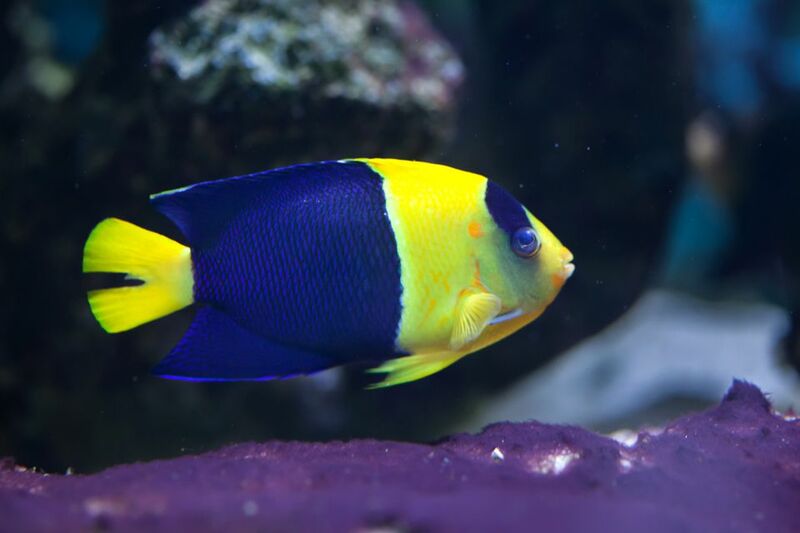 In the wild, the Black and White Bandit or Banded Angelfish (Holacanthus arculatus) feeds almost exclusively on sponges, making them difficult to maintain in an aquarium. In captivity, older juveniles and sub-adults seem to adjust to tank fed foods better than smaller juveniles or older adults. The Blue-Girdled or Majestic Angelfish (Pomacanthus navarchus) is large species that inhabit waters of the Eastern Indian Ocean and the Western Pacific. The Clarion Angelfish (Holacanthus clarionesis) in its sub-adult phase. This species inhabits regional waters off the Southern tip of Baja California. Being quite rare, this fish is very expensive, even for captive bred fish. Cortez Angelfish (Pomacanthus zonipectus) is a large species of Angelfish which inhabit tropical Eastern Pacific waters. Eibl's or Orangelined Angelfish (Centropyge eibli) is a small dwarf or pygmy species that inhabit waters of the Indo-west-Pacific region. This is a photo of a Fisher's Angelfish (Centropyge fisheri) which is a small dwarf or pygmy species. Aside from providing this fish with ample live rock for grazing, the Fisher's Angelfish should be fed a variety of foods suitable for herbivores and carnivores, such as Spirulina, marine algae, mysid shrimp, and other high-quality meaty fares. French Angelfishes (Pomacanthus paru) are members of this large species which inhabit tropical Atlantic waters. The French Angelfish has a tendency to nip at sessile invertebrates (soft and stony corals) and clam mantles and also tends to dominate the tank. An adult Gray Angelfish (Pomacanthus arcuatus) is a large species which inhabits the waters of the Western Atlantic. The Gray Black Angelfish is a sturdy fish, and can reach a stunning length of 20 inches as an adult. A tank of at least 259 gallons is recommended for this fish. An adult Koran Angelfish (Pomacanthus semicirculatus) will reach a length of 1'3" and requires a tank of at least 250 gallons. It is prone to nip at stony and soft corals (sessile invertebrates) and clam mantles so it is not a good candidate for a reef aquarium. The Lemonpeel Angelfish (Centropyge flavissimus) is a pygmy species which inhabits the waters of the Indo-Pacific but has been found as an aquarium release in Kaneohe Bay and Keehi Lagoon on the island of Oahu in Hawai'i. It is possible to keep a male-female pair or even a trio (one male and two females) of Lemonpeel Angelfishes in the same tank together, provided that it is a large aquarium with plenty of hiding places, and they are introduced into the aquarium at the same time. 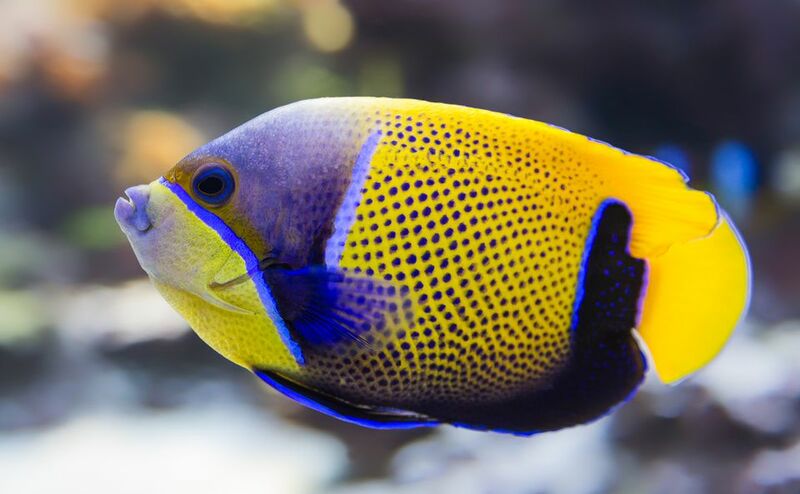 Although touted by aquarists to be a fairly good reef safe fish, the Potter's Angelfish (Centropyge potteri) may nip at large polyped stony corals, zoanthids, tridacnid clam mantles, and even some soft coral polyps. Therefore this fish, as true with most all Angelfishes, cannot be completely trusted if these invertebrates are present. It is best kept singly or in mated pairs and is suitable for keeping with other non-aggressive fishes. This medium-sized species inhabits waters of the Indo-Pacific region but has been found as an aquarium release in Hawaii. The Indian Ocean and Red Sea Regal Angel (Pygoplites diacanthus) specimens are more likely to be hardier, and therefore adapt more readily to aquarium life. For identification: the Indian Ocean and Red Sea specimens have an orange chest as opposed to the Pacific Ocean specimens, which have a blue chest.